| while you were sleeping | — INFINITY & CO. Most of the time when I post on here - I'm feeling spunky. Today is a little different. On a normal day - June would do something ridiculous that would inspire me to post or snap a photo. Today - there was just silence. ...and it was the silence that spoke to me. As I've mentioned before - it is a very rare occurrence for me to watch June sleep (other than on the baby monitor) She has always slept in her crib and RARELY falls asleep anywhere else. ...I mean even if it's midnight and she's been partying hard - she's going to stick it out until her head hits her crib mattress. It was time to leave the house so I walked into June's room with Mack on my hip to wake her up. My eyes met her face - her sweet sleeping face. To watch a child sleep is such an amazing experience. 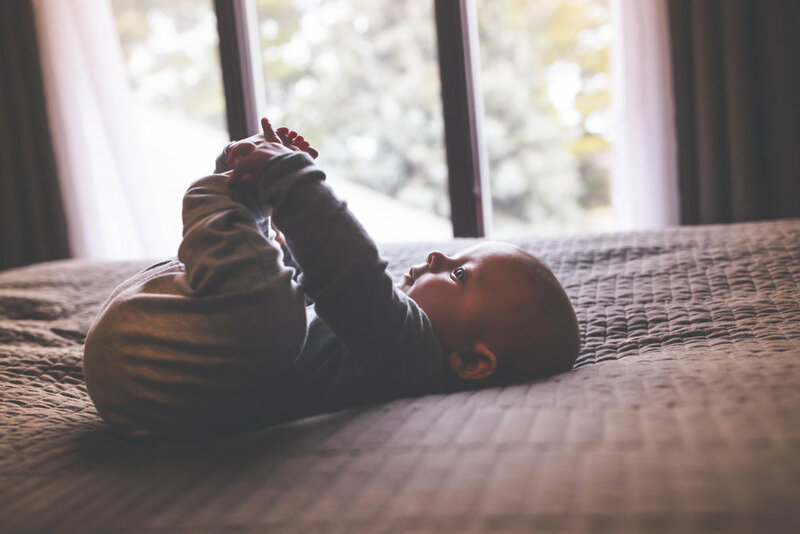 As parents we can sort of giggle because many times "nap time" is considered a golden hour or amazing because of the fact that we get a little bit of silence. In this instance...I considered this moment golden because I was able to stand there and let myself be completely overwhelmed with love for my child. I considered this moment golden as I watched her little body rest while the warm sunlight poured in on her innocent skin. Her chest moved up and down slowly with each calm breath - radiating peace. This is who I am meant to be. I am her mother - I am their mother. I am here to love and be loved by them. I couldn't bare to wake her - so Mack and I went into our room and spent some time playing with his toes and watching the trees sway in the wind outside. After a few minutes June woke up and we went about our day. Many times Pandora is playing in my vehicle. Today - after I experienced June's blissful rest - I decided to turn on the radio. Of course the song "You're Gonna Miss This" by Trace Adkins was on the radio. My eyes filled and tears began to roll down my cheeks. Some days are long. Some naps are short ...but do your absolute best to really take in and appreciate every moment. Live in the moment. Love more - worry less. They're only little for so long. They need you. To them - you are perfect. You are their everything. You're doing great, mamma! Keep on keepin' on.